Ocean County: Sheriff Shaun Golden was honored and proud to be one of the attendees of the 8th Annual Law Enforcement Survivor’s Day in Seaside Heights. The event marks a fun filled day for Survivors of members of law enforcement, who were killed in the line of duty, to come together, enjoy themselves and form supportive relationships. This year, approximately 46 law enforcement families who represent 28 fallen officers were in attendance. Lt. 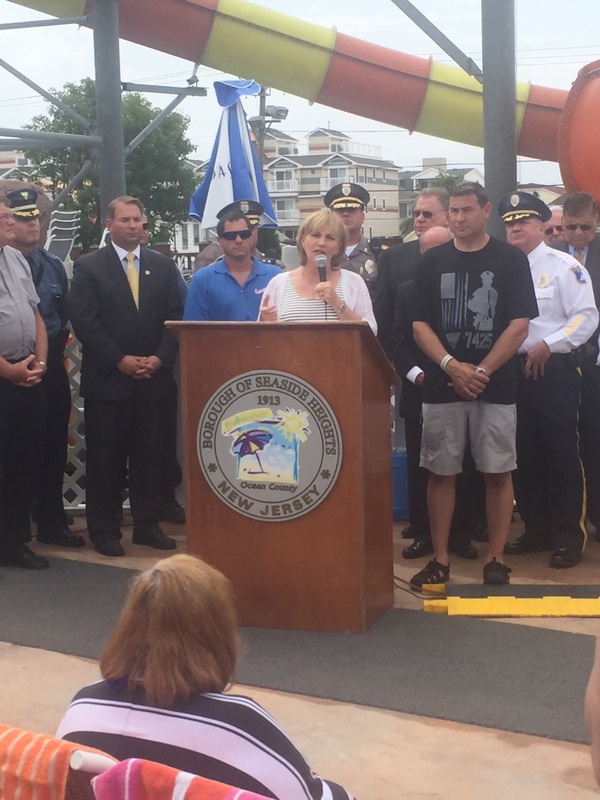 Governor Kim Guadagno, former Monmouth County Sheriff spoke at the ceremony, which was hosted by Vincent Storino and his family, the owners of Jenkinson’s Breakwater Beach and Casino Pier. Members of law enforcement throughout the state were in attendance. Since 1854, there have been nearly 500 New Jersey police officers killed in the line of duty. This year the two most recent officers killed in New Jersey were recognized, Det. Scott Stevens of the Ocean County Prosecutor’s Office and Trooper Anthony Raspa of the New Jersey State Police. The Monmouth County Sheriff’s Office continues to support the families and honors the sacrifices of our fallen heroes.